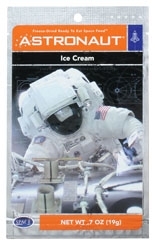 Enjoy your ice cream just as the Astronauts do – the freeze-dried way! Astronaut Ice Cream as well as other freeze-dried food items, have been aboard space missions since the early Mercury Missions. They continue to be used on NASA missions today. Ice Cream is Chocolate, Vanilla and Strawberry ice cream slices. Each packet is 120 yummy freeze dried calories. Contains milk. Nom Nom Nom!